After a night of listening to others snoring and getting up and going to the bathroom, it was finally 4:30 a.m. Not that I wanted to get up, but a lot of others did so. After laying there for about 20 minutes I decided to get on the move. I got packed and took off, sore feet and all. I was making pretty good time and before I knew it, I was in the little village of Ages, which had a number of albergues and pensiones. I wish that I could have made it there yesterday, but that wasn’t the case and so I pushed on. At that point I had given up on catching up with John. He was in a good stride and with my feet, until I can get them healed I would just have to slow down and do shorter days. I still have plenty of time and as they get better I will be able to make up the time and distant. There were quite of peregrinos on the trail early this morning, at least ways more than yesterday at that time. After a while I saw a couple of little bars starting to open so I started to look for a place to get a café con leche and something to eat. 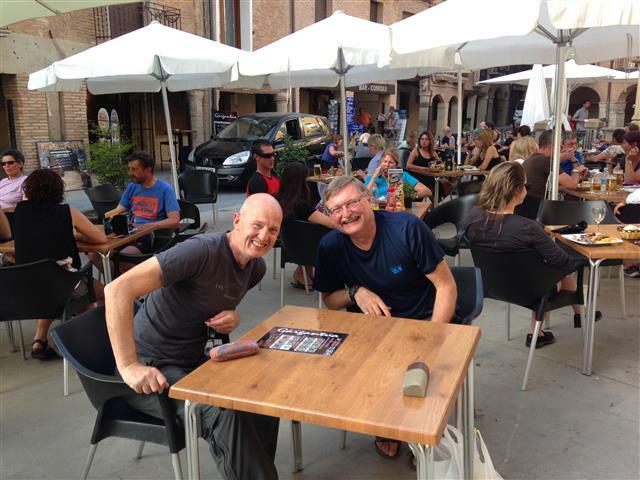 I finally got to the little village of Cardenuela Riopico and to my surprise there sat John enjoying a café Americano (he drinks it black) so I grabbed a chair and table. It was great to see him again even though we both knew that our walking time was coming to an end because he was on a much faster schedule than I was. We sat and ate and caught up on what had been happening these past few days and after I finished breakfast, we packed up and headed off toward Burgos. It was still very early in the morning and I was starting to believe that I’d get the next 13 km knocked out. 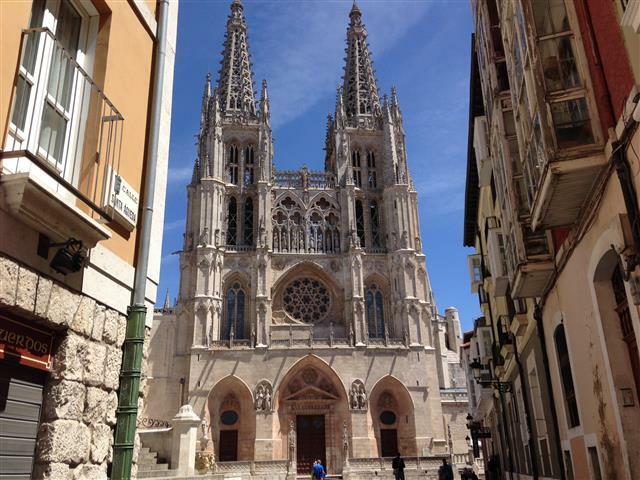 John was booked in a nice hotel in Burgos next to the Cathedral so I thought that I would also see if I could get a room there. It was a pretty easy walk except for the last several kms as it was a road walk and the pavement burns your feet. We had opted to take the road path instead of the other option on the lower side of the airport as it is again known as be a possible mud hole with a clay type mud that you can’t get off. I think that this was a good decision even if it’s hard on the feet. 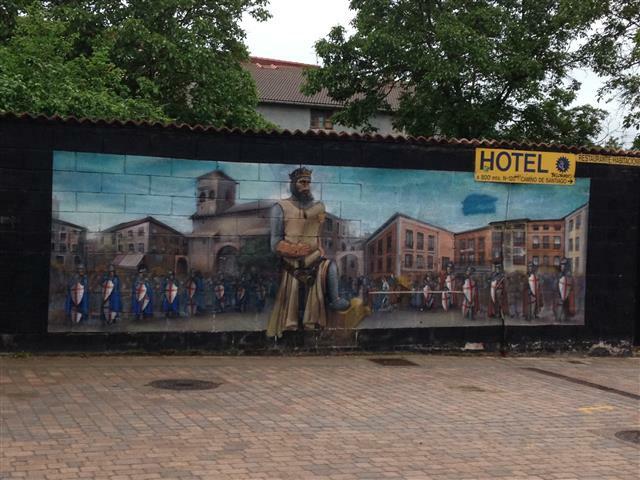 Well we finally got into Burgos around the noon hour and they did have a room for me for the nice price of 65€. I won’t do that very often, but I did to clean up and work on my feet again. I made the decision to take a zero day (stay in town and rest the feet one more day). I pretty much stayed in the room, but John and I met for dinner around 7:30 and walked down to the plaza to see if Gary (the Canadian forester) was going to go to dinner with us and also a new fellow that John had met earlier by the name of Bill. Bill was from California. Gary didn’t show, but Bill did so we went and got a Peregrino dinner. After dinner we just headed back to our rooms and I started to calculate my distances and how much time that I have left and my schedule. I then watched some television (all Spanish but it was good to listen to). I finally went to sleep around 10:30 as it was at last dark. So I believe that all in all it has been a good day, I made my miles and …well my feet are my feet, but they are getting better especially after a day of rest tomorrow. 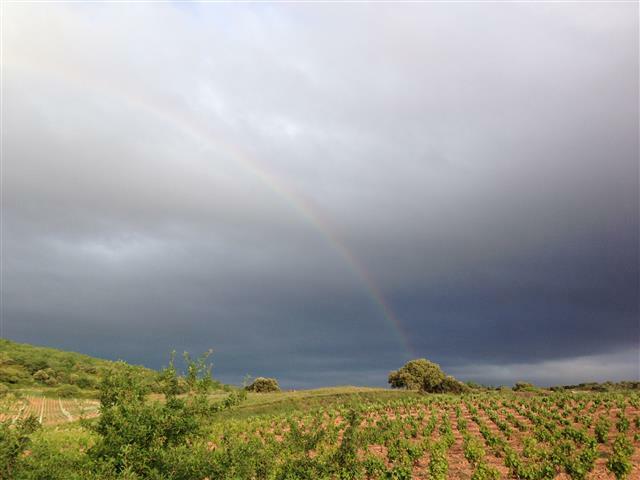 So again with that, and all the news from Spain I will say…Buen Camino. Highlights: Very few; it was a bland trail day. Today started out at 5:30 a.m. walking out the door of the Albergue. I hadn’t walked more than 20 feet and it started to rain so I turned around and went back inside to get rain gear on. Walking in the rain isn’t so bad in that it gives you time to think about everything. Although all I had to think about this morning was the fact that it was totally dark and the little yellow arrows marking the way seemed to be non-existent, and that my feet hurt. It’s a heck of a way to start a day. The little Albergue turned out to be a really nice place and you wouldn’t know it from the looks of it and the way it is run. As you recall I wanted a private room, which I sort of got. I paid for two bunks in a large closet with a curtain for a door, but the rest of the story is that there were only nine people staying there including myself so it wasn’t crowded. There was a couple from Italy, three from Denmark, one from Canada, one from Israel and then me. The man and woman that run the place explained the fees on everything. First it is 5€ for the bed and then everything else is by donation only. They said that dinner was going to served at 6:00 and the she would call us. About 5:45 she came up to the rooms and said to come on down. She and her husband had make a large pan (24” diameter) of Paella, a large salad along with desert. She also put out several bottles of red wine and bottles of water. The meal was wonderful, but the thing that floored me was the fact that after the table was set and we were starting to eat she and her husband both said, "buenos noches" and that they were going home. The last person to leave in the morning was to just put the lock on the door. We had the best time that night. We ate, drank some wine and then all sat around and talked for a while after dinner. On the trail the next day, it finally got where I could see well enough not to have use the head lamp and I was pushing a long at a pretty good pace so that I could possibly catch up with John. I knew he was leaving Belorado at 6:45. I knew that I would be somewhere behind him but should catch shortly after Belorado, but that didn’t happen. I had to slow my pace because of my foot. 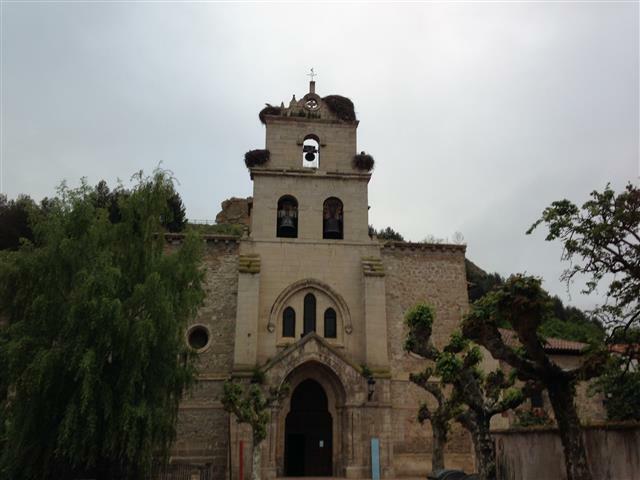 I finally got to San Juan de Ortega, almost 33 km from where I had started that morning, at around noon thinking that I would get into a Pension, but that too didn’t happen as they were all full. It was too far and I hurt too much to push on not knowing what to expect so I got a bed from “hell” in the Albergue for the night, but at least I was inside and they fed me as well. The mattress was like sleeping in a hot dog bun, you sank in the middle and the sides rolled up around you. It was quite different. I started working on my foot to see what I could to ease the pressure and the pain, so I decided to lance it and drain the thing. Remember I mentioned earlier the it was about the size of a silver dollar, well it much bigger than that after the 33 km day. When I was starting to go to work on it two young ladies came in and started to watch. Jacklyn and Tanisha (sp?) were friends that had served together in the U.S. Army. I told them that I had been a Medical Corpman in the Navy and they said that they had been Medics in the Army medical corp. They had a nice medical kit and let me use some of the stuff in there. I finally got the blister drained and bandaged. 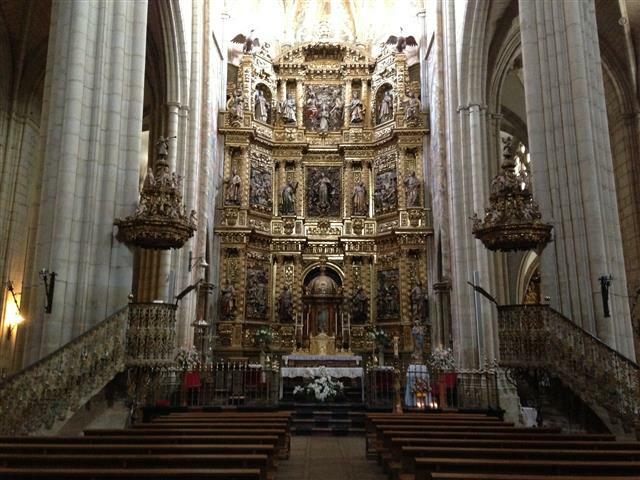 It felt better but still hurt so I don’t know what tomorrow will hold for the long walk to Burgos, only time will tell. After that everybody seemed to turn and drift off to sleep, that is until the snoring started, which was only about 30 to 45 minutes after it got quiet. That was a longer day then I had expected but I’m doing my best to get back on track for good towns with nice little restaurants and places to stay. I’ll see if I can make Burgos. Will let you know tomorrow, so with my sore feet and all I bid you a… Buen Camino. I slept in this morning because they fixed breakfast where I stayed (toast, café con leche, and orange juice), but I was out by 7:30. It was a nice day to walk and I was making good time, in spite of the fact that my right foot blew up yesterday and I have a blister the size of a silver dollar or larger. It looked like rain several times but never did. I didn’t see many people on the trail coming from Ciruena. I believe that I’m in a spot on the trail where most are pushing on to the larger towns. Several days ago I got out of the higher mileage sections that most everyone is on. I’m doing the same miles but just can’t get back on tract. I am going to have to change that so that the towns I get to at the end of the day have several places to stay and a restaurant. The one tonight doesn’t have a restaurant, but the woman that runs it says that she will cook dinner. I got to Santo Domingo which is a fairly large town. It would have been nice to get here yesterday, but it was just a few kilometers too far for me, because of the 30+ km that I had already don, and the same is true for today. Most of the trail from Ciruena was on a path, but after Santo Domingo it was mostly road walking, which created the problem with my feet in the first place. You’ll find that hard packed road are about the worst thing you can do to your feet. Overall today's walk was pretty much just walking along wheat fields and major highways. You will have days like that where you just have to put just put you head down and walk. This was one of those days. I did my distance and was done by noon so I could get cleaned up and rest my foot. I will determine what steps I need to take to cure the foot problem tomorrow, but for now all is good. An interesting note on the little Albergue that I’m staying in, when I called yesterday to first check to see if they had rooms and secondly reserve one, the woman that runs the place said yes they did but it had two beds and if I wanted it I’d have to take it as a double. When I asked her how much it was she said 10€, so I took it. When I got here I saw that it was just a small room with a bunk bed in it and no door, only a curtain hanging over the opening, but it didn’t matter as there was no one but me here. Around 4:00 some people started to come in. I asked about dinner and the woman said that she cooks dinner for everybody at 7:00 p.m. I will leave here in the morning and meet up with John for breakfast. Well that’s about all the news for today. I will fill you in on dinner and the continuing walk west tomorrow. So as always…Buen Camino! The day started early for me as I was having to do a 30+ km day because there weren’t any places to stop with both rooms and restaurants. 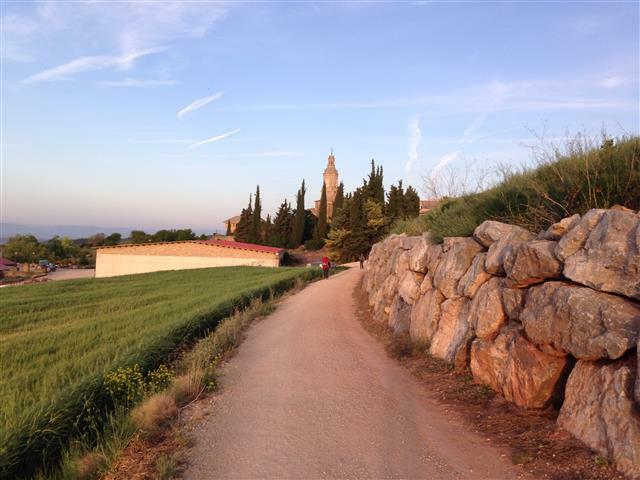 Since John did his 40 km walk yesterday, we are separated but planning on catching back up before Burgos, so that we can walk the Meseta together. At some time we will be parting company due to completion time differences. I was on the path at 5:40 a.m. The weather has turned cold and it probably was only in the upper 40s F. When I left and only rose to the lower 50s later in the day. It was overcast but no rain, just a few sprinkles along the way and this made daylight come later in the morning. The winds were blowing almost as hard as when I came over the Pyrenees but a lot colder. When I got to Ventosa the bar was just opening so I stopped in for breakfast. There were only a few people there and I hadn’t seen the usual crowd of people starting early. I guess the cold weather kept them in this morning, and I don’t blame them. If I hadn’t needed to do big miles I would have left later myself. After breakfast I headed on to Najera which was pretty much a path along a roadway, but without traffic. The pavement still made my feet sore, and especially since I already had a couple of blisters from all the hot days. As it got later in the morning I kept noticing very few people still so I guess they passed through yesterday. 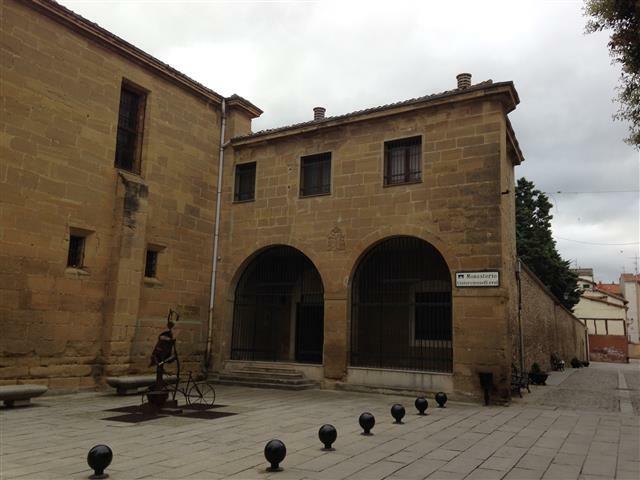 The city of Najera is really an interesting city. It is like a maze through the city with narrow streets with cars and trucks zipping along. One time I heard a horn blow and when I looked back there was a big bus trying to come down the street, but he needed me to step into a shop doorway so his mirrors didn’t hit me in the head. I thought this was an interesting city because right in the middle of it there was a tunnel that connected several buildings with a series of archways. When you start to leave the town you cross a river bridge but but beyond that there are large cliffs. From Najera it was a relatively easy walk to Azofra where I had another café con leche with a woman from Oregon. She was telling me about the property that she bought in New York City back in the 80s and now it is giving her a great retirement. I guess there’s still money in land and housing. After the brake in Azofra it got a little tougher not only because of my feet but the terrain change as I neared Ciruena. There was a really long up hill (which I thought wasn’t going to end anytime soon, but finally did) and to my surprise there was a man selling oranges and bananas along the trail. I bought one of each and kept moving. In a short distance I came into Ciruena, which two years ago was a brand new golfing community with no one living in the houses. Well it’s been two years and it’s still a golfing community and still no one is living in there, but I did see one golfer in a golf cart and at the far end of the community there is new construction going on. Try to explain that logic. Anyway I went to an albuergue to see if I could get a room instead of just a bed and they had rooms available so I took it for 25€, a good price. They called someone and she came and took me back to the room, and much to my surprise, it was the same place that I stayed two years earlier. It was a great place then and now. The people are friendly and helpful. At seven o clock tonight they fixed dinner for all the people in the albergue as well as me. It was a fun time; the food was good and so was the company. I sat with Jenny and Mark from New Zealand, and Judy from Australia, as well as a Brit named John. We talked about everything before dinner to a good while after. This really makes me miss the company of John and I hope that we can catch up with each other soon. Possibly in another couple of days. Well another day on the Camino and even the weather and miles can’t take the joy out of the walk. As hikers will always tell you…”A bad day on the trail is always better than a good day at work” so with that I’ll say good night and I’ll let you know where we go tomorrow…Buen Camino! We were going to get up this morning at 5:00 a.m. But I woke up at 5:20 and looked over at John and he was still fast asleep. I guess our bodies are telling us we need more rest or at least more sleep. We started to move about and finally got out of the hotel at 6:00. 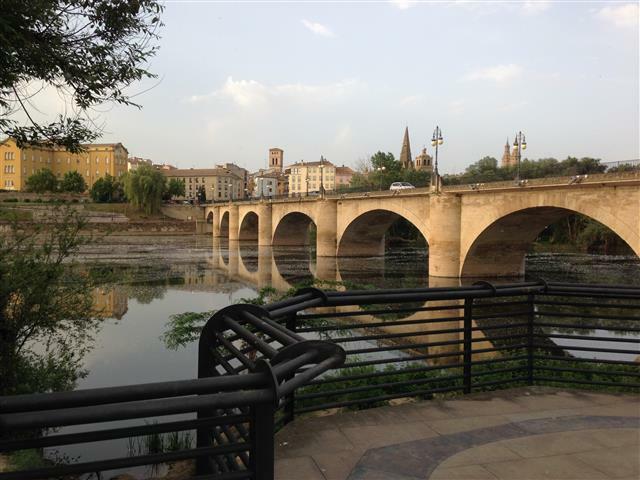 It took us a few minutes to get out of town and a couple of times we had to search around and find the markers, but we did get underway to Logrono for breakfast because we both knew that there wouldn’t be any place to stop or even something open. 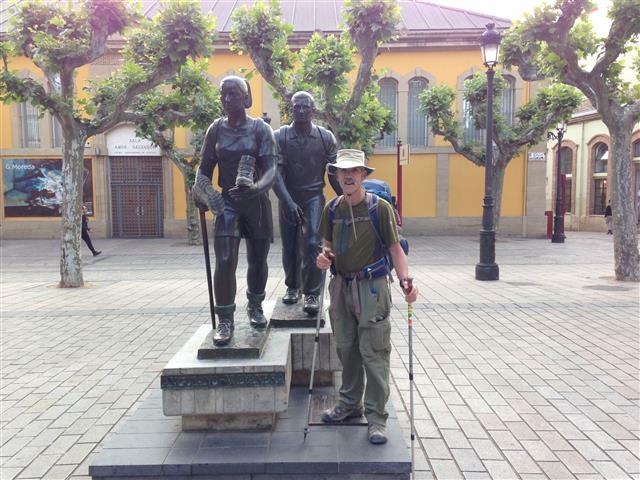 The path from Viana was a great trail. It was level all the way to Logrono and out the other side all the way to Parque de la Granjera. When we got into Longrono it was like any other big city; the people were hustling around going to work and the kids were walking to school. We passed through the center of the city just past the roundabout and there was a great little restaurant so we decided to stop in and eat breakfast before heading on. When we went in there was a South Korean man that we’ve been seeing for awhile. He doesn’t speak much English, but we found out that he has climbed many of the highest peaks in the world and that he is traveling around the world on foot. I wish that he spoke better English or that I spoke Korean, but for now I’ll just have to continue to struggle with speaking Spanish. After a really good breakfast we headed back out of town and through the park. The parks in Spain are beyond belief. They are filled with people and everybody talks to one another and yet with all the people and the dogs running around, the park is spotlessly clean. In the back part of the park, there is a lake where the path crosses the dam. There are a lot of older men on the dam with their fishing equipment just fishing away. I didn’t see anyone catch anything, although I did last time I was here. At any rate, they were all fishing and talking having a grand ole time. 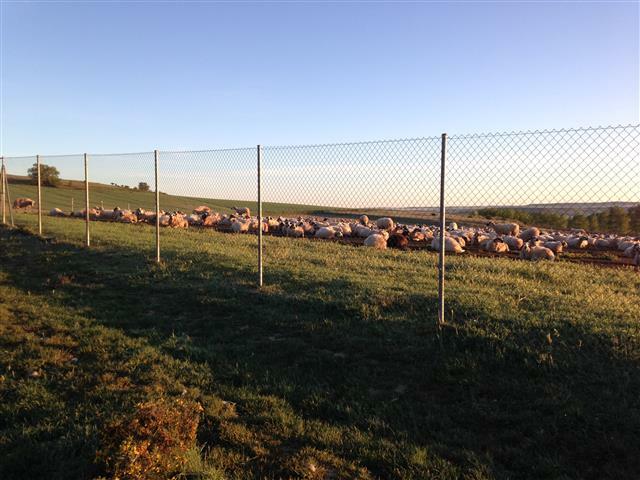 There are a few things that we could learn back home about what the people do here in Spain. They seem to take a little more time to enjoy life and the pleasures around them as well as taking time to talk to their neighbors and friends. We seem to always be on a fast track to somewhere, but who knows where. I can tell that the seasons have changed. Today there are fields of red poppies in full bloom as compared to a week ago when I would only see one or two at a time. A little yellow flower is also starting to bloom everywhere. I remember last time I was in Spain that I asked about them and someone told me they had some kind of medicinal use, but I don’t know what it is. 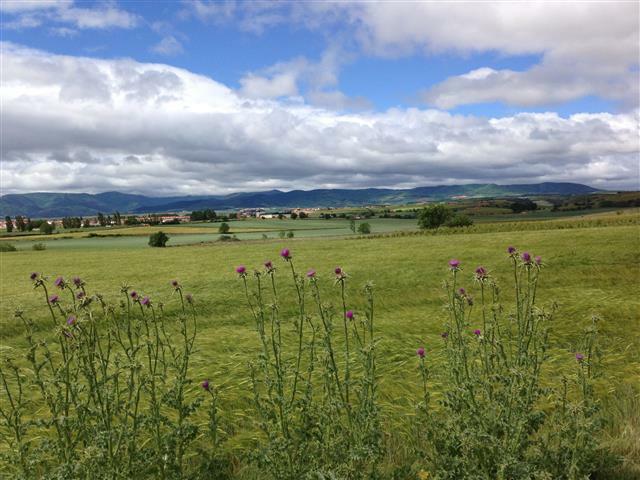 The thistles are also coming on strong. They produce a really pretty purple flower and are great to look at but not to touch as they have a lot of stickers. I know on the Appalachian Trail, if you brush up against a thistle you will remember it for a long time to come. It’s nice to have all the colors in pictures. I saw my first stork in the nest today, and I know that I will see a lot more in the coming days. They are a really big bird and between them and the babies they take up the entire nest. When the babies get bigger the mama stork sits on the edge and just hangs on. I remember seeing a number of sea gulls trying to get the babies and a real battle ensued between the mama stork and the gulls; the sea gulls lost. It wasn’t long after that John and I reached Navarette, where we had a café con leche and he made his push to complete his 40 km for the day. I stayed and went up to a nice hotel that I had booked the day before and checked in. It was really nice and looked over the entire city, but then again there isn’t too much city to look over. A Peregrino meal was served in the hotel restaurant so I just ate in there. The rest of the day and evening was left to just resting and getting ready for the next day, which I knew was going to be a big one. I am not sure what the weather is going to be, some call for rain and others for only clouds. Tomorrow will be what it will be. That’s about all the news for today, and I will let you know what happens tomorrow in my ongoing journey across Spain. So until then…Buen Camino. 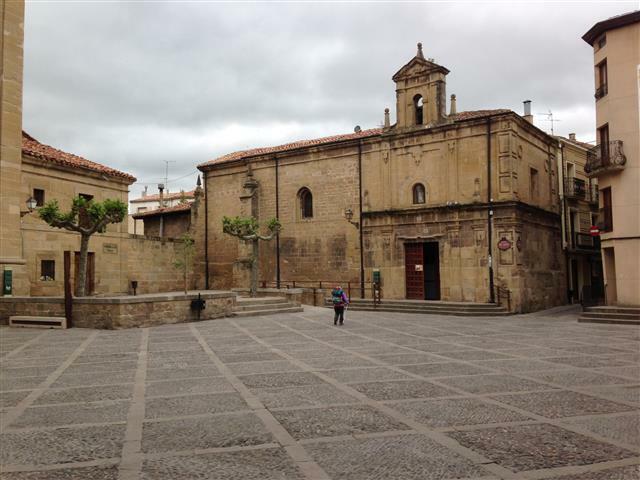 Highlights: Viana Centro Inglesia de Santa Maria Church, the grape vineyards, and the views of the mountains to the North. Last night was a pretty bad night's sleep as it was hot in the room because there was no breeze blowing and even with the windows open, it felt stuffy all night. I don’t know if I mentioned that none of the rooms have air conditioning in them, so you rely on the outside air blowing. At any rate, I was up at 5:00 a.m. to get a jump on the heat that was coming today. They have predicted that it was going to be 36° C (92° F) today and I wanted to do my mileage by noon. We walked out on the trail by 5:30 and it was dark, but I did have my headlamp in case I needed it. I love walking in the dark with all the stars shining; it’s like another world. Finally around 6:15, you could see pretty well. As it turned out a lot of others were out early as well. This area of Spain is mostly grain fields (I think wheat) and grape vineyards. All the farmers were in the fields early as well, either tending to the grape vines or plowing in the fields. It wasn’t too long before we all could hear the café con leche calling to us from Sansol. 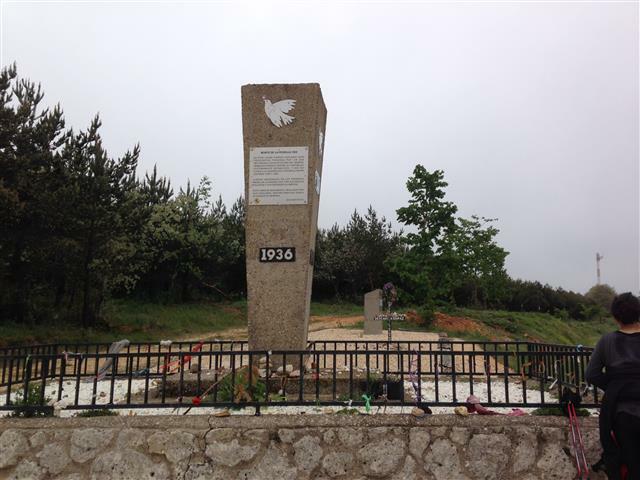 When we got there they had just opened and were cooking egg, cheese and ham sandwiches, which disappeared in no time. After a nice break and talking to Gary from Canada and Phenolla, a woman from Ireland, we all packed up and headed on. It was an interesting walk both along a path as well as a paved road. Gary and I talked about forestry as he is retired forester from Vancover and he dealt with the different bands of Indian tribes in Canada. Phenolla is a triple crown swimmer and has swam (what I guess are the three major swim contests) one which is to Catalina Island and back in California. It seemed like more and more people were starting to catch up with us and the line of hikers was growing. It sure made me feel good to know that we had a room secured in Viana. 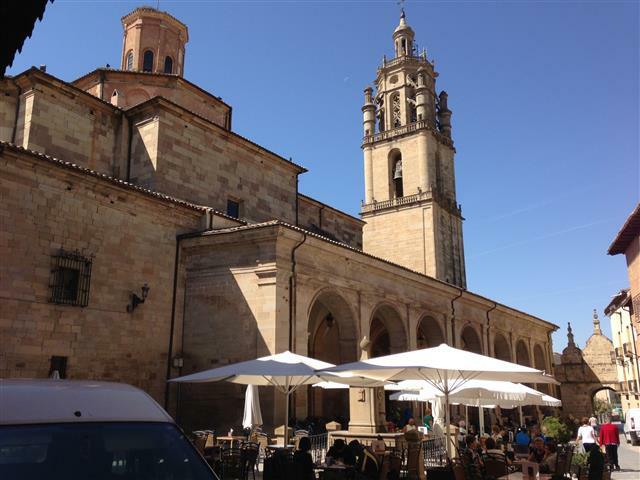 We finally arrive in Viana at about 10:00 a.m. And we figured it was too early to check in so we stopped at one of the many local bars/café to get something to eat and drink. At about 11:00, John and I headed on down the street to find the hotel. It was right on the path so it was easy to find. 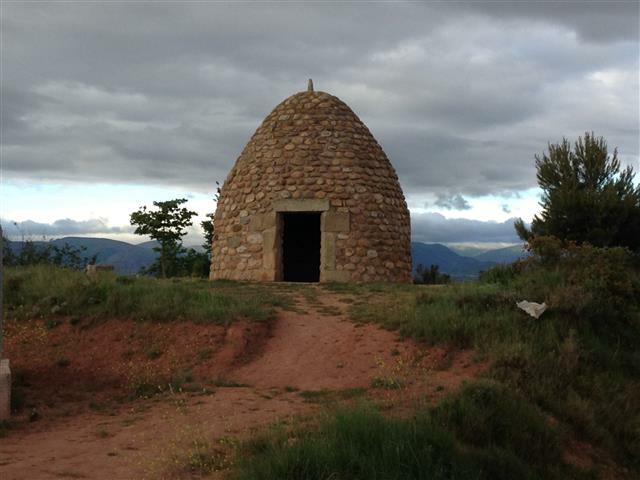 The entrance to the Placio de Pujadas opened right on to the Camino. It was a three star hotel and it had something that I hadn’t seen on any hotels/Pensiones, or Hostelles here and that’s a sliding glass door. This was a lot fancier place than I thought we were getting and we got this all for 70€ for a double. In the states it would have been a lot more. After we checked in and got cleaned up, we started our daily chores. A little while later John came back and told me about a really nice tea shop by the name of Pilgrims’ Oasis. it was just down the street, so I went down to have a cup of tea only to discover that it had all kinds of tea from different places, both herbal and not. The place was quiet and cool with good music. The owners, Lauren and Terri Wells were both from California. They had moved to Spain 19 years ago and they loved living here. They were telling me that when they came here the only Spanish they knew was Si and No, but studied and learned. It was interesting talking with them as they gave me tips on what to do on improving my Spanish and continuing to become fluent. 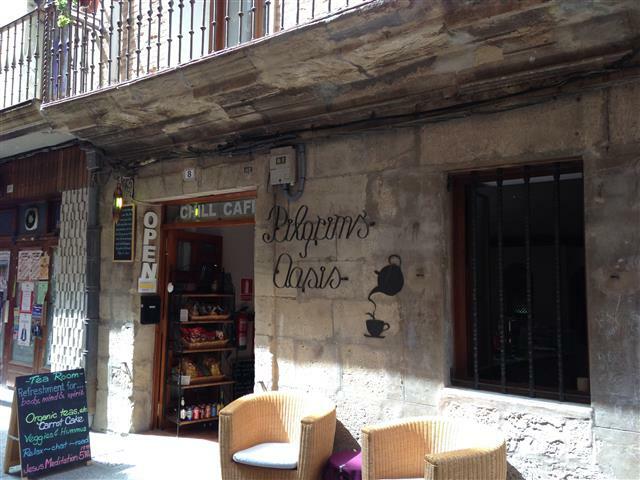 (Just a side note for those that are coming to do the Camino and you’re passing through Viana, be sure to stop in the Pilgrims’ Oasis and check all the teas. It is great and the owner’s are the best). After spending about an hour with them, I headed back to meet John for dinner. We decided to eat from the Peregrino menu in the hotel. I had a steak with French fries and a green salad with tuna (on top), and then for desert I had the caramel flan, which I didn’t discover how good it was last time until my journey was over. The Peregrino meals are generally from 10 to 15€ and they are a real bargain. After dinner John went to a bar down the way to watch a big futbol match, and I went to pay for our room and start getting my stuff ready for an early departure in the morning. John is going to make a go at a 40 km day, while I will only do 23 km. We will walk as far as Navarette together and then he will push on. I will be in contact with his wife in London via e-mail to coordinate our reconnection in a couple of days. This has been a great day: beautiful weather, beautiful country and towns, and wonderful company with new friends. I am looking forward to the rest of the walk. So until tomorrow, I will say, hasta luego y Buen Camino! Weather: Beautiful blue skies. Not a cloud in the sky. 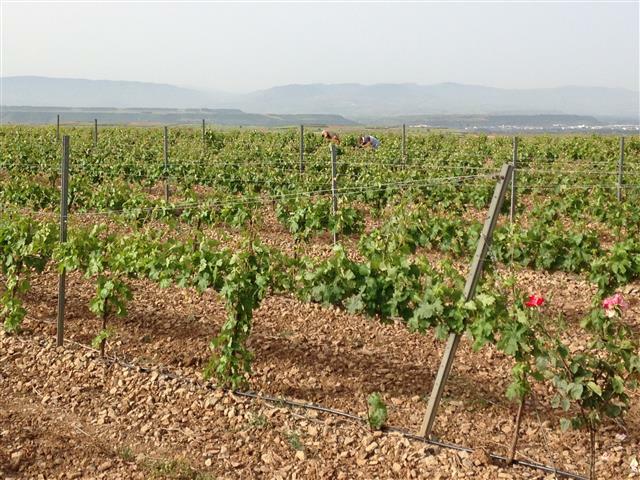 Highlights: All the different fields with various things growing, grains, grapes, and for the first time olive trees. The mountains in the distance are so impressive. Last night, we started checking the weather to see what the temperature would be for today. It appeared that it was going to be around 33° C. I’m told that to convert to Fahrenheit, all you have to do is double the centigrade and add 20 and it will give you a close idea. Now if that works we knew it would be around the upper 80s so we decided to leave around 5:30 this morning to beat the oppressive heat. We got up at 5:00 and were in the street by 5:30. It was still pretty dark but the street lights did manage to guide our way. We did misplace the path briefly a couple of times, but quickly recovered. 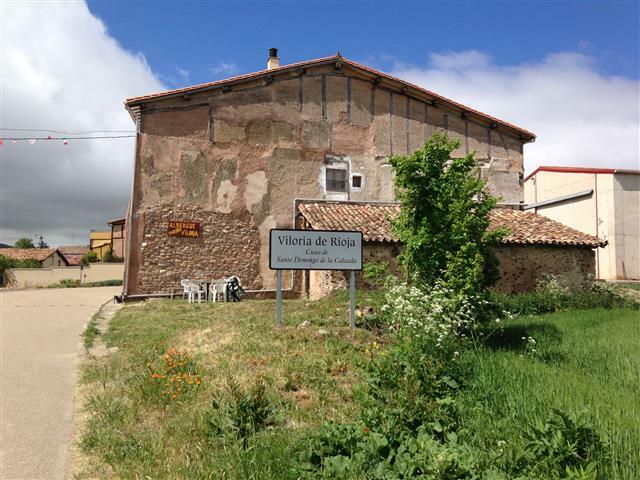 We unfortunately missed seeing the Fuentes de Vino at the Bodegas Irache. This is a bodega where you can go to the back of the winery and pour yourself some wine, although two years ago I went there and had a taste and it wasn’t the best wine. Having said that I’m sure they don’t put there top seller out for free, and in unlimited quantities. As the skies started to lighten up and we could see clearly, John and I moved away from the business end of the city and on to the path. The temperatures were nice and cool and we made great time. There were a lot of other Pilgrims that thought like us and left early as we could see them in the distance. Café con leche was no where to be found along the trail at this time of the morning so we didn’t even bother to look. It wasn't long before the path started going through beautiful grain fields and grape vineyards. It’s amazing to see the deep greens of the fields contrasted against the blue skies. It is a color combination that pictures just somehow don’t do it justice. We had our share of ATVs coming along. I guess, like in the states, there are motorcycle clubs that get out and ride the back roads and trails together, so Spain has the ATV clubs and they ride as well. I would say that about 10 or so came through. They were respectful of all the Pilgrims and slowed down when they passed, but the dust was something else. Finally rounding a bend in the trail you could see a little trailer just ahead and to the side of the trail. It was like a dream come true, a mobile café. It was Eduardo and his mobile café. It was a little restaurant on wheels, complete with café con leche, fresh squeezed orange juice along with a lot of fresh cooked items to eat. And even though in the middle of nowhere it was all reasonably priced. After resting for about 30 to 45 minutes everyone packed up and pushed on to Los Arcos. It wasn’t long before we came into the outskirts of Los Arcos. It was hard to believe that just strolling along, that we had finished our day's hike by 10:00 a.m. It doesn’t matter to me about finishing early as it gives me time to rest, eat, and take a walk around the towns, take pictures, and try to practice my Spanish that I’ve been trying to learn for a while now. I stopped in a little bar and had another coffee until about 11:00 and then went to the Hostel and checked in. I got to talk to the Italian lady that I met a couple of days ago. She was pushing on. I will meet back up with John and we will go to dinner and if possible join some other Pilgrims. John has been meeting many people along the trail as he walks. It doesn’t matter whether they speak English or any other language, he seems to be able to draw their story out and converse with them. There all walks of life here and all are trying to get to Santiago. It has been a great day and it’s time for dinner. Will keep you updated on my journey…Buen Camino.